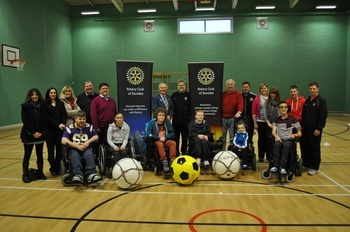 e.jpg" /></a></div> th="560"> I was really pleased to attend a taster session for power chair football in Dundee today. I am a member of the committee of Dundee City Disability Sports and I was delighted to support this event. It was good to be joined by my colleague Councillor Lesley Brennan, it was also good to see the event being supported by the Rotary Club of Dundee; finally I was delighted to see the event supported by Dundee United and to see Michael Gardyne supporting the event. It was a really impressive session and I hope that it leads to a power chair football club being set up in Dundee. The video above is from the Scottish Cup played last November in Glasgow. On a day when it was being reported that the Paralympics had not led to an increase in disabled sport it was great to see young people interested in a new sport. I hope that this is success and I would like to say well done to everyone who supported today's event. A report on today's event is available on the Dundee City Disability Sports website if you are interested in taking part in power chair football or supporting it there are click on the link and get in touch. As Dundee Labour's Environment Spokesperson on Dundee City Council today I backed calls to re-name Caird Park Stadium in honour of the late Ronnie McIntosh. Caird Park Stadium is in the care of the City Council's Environment Department. I believe that there should be a lasting memorial to Ronnie McIntosh's memory in the city and I believe that re-naming Caird Park Stadium would be an appropriate way to remember Ronnie McIntosh. I was very sorry to hear of the death of Ronnie McIntosh. I met Ronnie on a number of occasions, nearly all related to sport. I vividly remember speaking to him on the evening when the Olympic flame came to Dundee, Ronnie was clearly delighted to have been one of the torchbearers in Dundee. I know that he had used that event to encourage others and that he had taken his Olympic Torch to a number of organisations and tried to encourage young people especially in sport. For example, he spoke to my daughter's gymnastics club. I think that there should be a lasting legacy and memorial to Ronnie in Dundee. It is important that his memory is honoured in some way. I support the call to re-name the Caird Park athletics stadium in his honour. I also think that we should be looking for ways to support disabled sports more. I have written to council officers to ask for their views on this issue and to see how it could be taken forward. It is clear to me that if the stadium at Caird Park is to be re-named in Ronnie McIntosh's honour then the people of Dundee will have to make their views known and tell their local councillors that they support this move. I would also urge people to show their support for the Evening Telegraph's excellent campaign. I have long been campaigning for better rail services to and from Dundee. It is important for the economic development of the city that there are good rail links to and from Dundee, indeed the success of the V & A will be partly dependant on it. This is why it is ludicrous that it is being reported that for four people a taxi to Glasgow and back from Dundee would be cheaper than four return rail tickets. This a tax for travelling north of the Tay - the Tay Tax. It is also ludicrous that there are, as regular users of the rail service will know, bizarre ways to make the price cheaper at certain times. Surely the fare structure should be clear and understandable, and surely the staff should be under an obligation to sell you the cheapest ticket possible for the journey you want to take. Prices for rail travel in and out of Dundee jump as soon as you pass either Perth or Kirkcaldy. Dundee falls outside the subsidised rail zone, but we need to get our fair share of rail subsidies. We should be looking at encouraging more people to use the train it seems to me that we are trying to discourage people from using rail travel. As my colleague Jenny Marra says the Scottish Government should be looking to sort this out. I want Dundee to have a rail service fit for the twenty-first century. The city needs to attract tourists especially to the V & A at Dundee. The city needs to be an easy place to do business and I worry that if you are based in Glasgow would paying over £50 for a rail ticket not put you off travelling. For the good of the city we need to have good connections with other parts of the country and in some respects cost is part of that. The Tay Tax is a disgrace. I welcome moves by Iain Gray MSP to bring in a Members' Bill in the Scottish Parliament to improve bus services and ensure that they are 'services' for the people who use them. The Bill being proposed by Iain Gray would give local authorities the power to 'bundle' profitable and loss making (but socially desirable) routes together which would be tendered together as a 'quality contract'. I supported similar plans in the last session of the Scottish Parliament put forward by Charlie Gordon, unfortunately no party other than Labour supported these I hope that the situation will be different this time. I support the work being done by Iain Gray on the important issue of bus services. There is a clear need for more regulation. 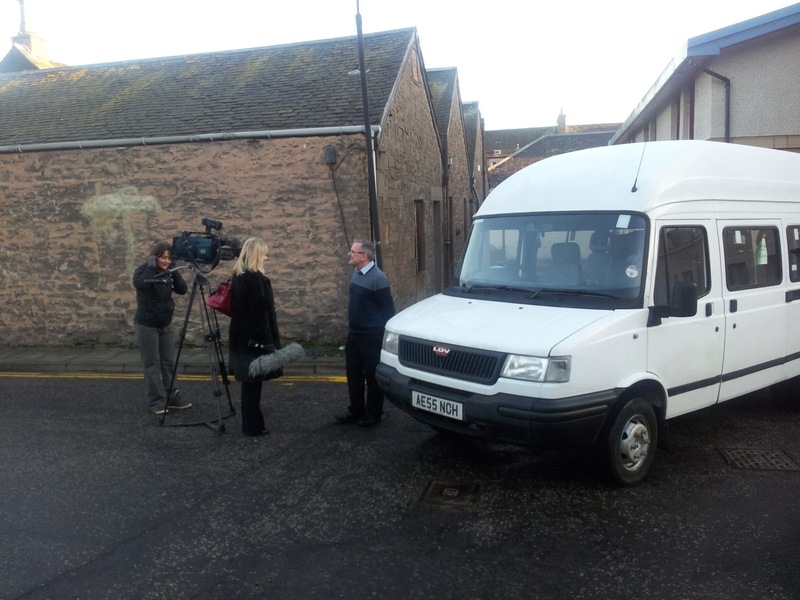 In Dundee we have two bus companies operating who offer excellent services for areas where a profit can be made but where there is a poor service for other parts of the city. We normally talk about a bus service, there is an issue in my mind as to whether there is actually a service being offered or are services only run to make money. It is important to remember that the public sector provides quite a lot of support for bus companies including the subsidised free travel and other things like bus shelters and information I think it is fair to ask does the public get enough in return? In the West End there are excellent services to and from Ninewells Hospital but in some other areas such as the Logie estate and the Pentland estate there is a service which does not meet the needs of the residents in these areas, especially the elderly. I think that the successful services in the West End should be used to maintain the other services which are socially desirable such as ones which benefit elderly residents in the Logie Estate. It seems clear to me that bus companies will not deliver socially useful services unless they are made to. I will be looking for the consultation document when it is published and I will be responding to it, I think that it is important that changes are made to the bus industry to ensure that a bus service is offered to everyone in Scotland. I was delighted to join others from the Jericho House support group, residents and staff in celebrating Jericho House's new mini-bus. Jericho House does a great job helping people who have a problem with alcohol addiction. 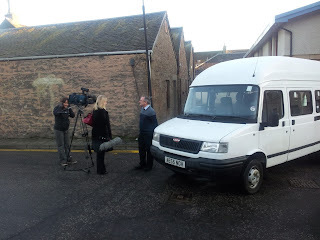 I know that Jericho House will make good use of this mini-bus. It is good to hear that the money has been raised in Dundee and to hear how appreciative those involved with Jericho House are of the support they have received. If you can support Jericho House please look at the website. On Tuesday evening I attended the January meeting of the West End Community Council. There was a very interesting presentation on the work of the council's Environment Department given by the Director, Ken Laing. There was also a welcome update from the local community police officers. The police pointed out that local residents should be vigilant about possible thefts from homes, residents were reminded to ensure that their houses are locked and that lights are left on when people are out. As ever the Community Council provided an excellent opportunity to listen to the concerns of local people in the West End.